Being one of those Londoners with as busy a life as the next person, I sometimes struggle to recall what happened a fortnight ago, let alone a 1992 animated motion picture which I only went to see out of a sense of duty, after I had no idea what everyone else was on about at the time. 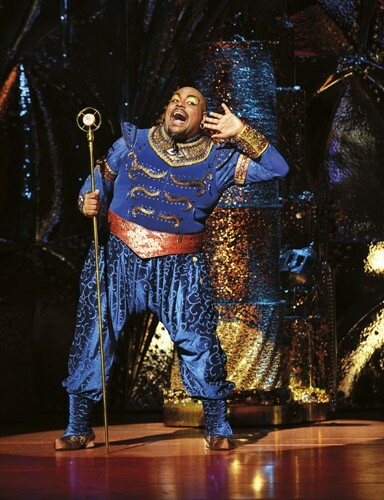 But strenuous efforts have been made by the Disney Theatrical Group to take those who enjoyed Aladdin as a motion picture 24 years ago and now have the disposable income to splash out on a night in the West End. Even by West End standards, this is a big and bold production. The list of credits in the programme is about as long as could be expected from a Hollywood movie if watched to the very end. I am not entirely sure why particular attention has been paid to the place of birth of cast members in the programme, except perhaps to demonstrate that this show has a cast almost as international as its predecessor in the Prince Edward Theatre, Miss Saigon. Some thought has been put into this production to make it directly relevant to a British audience, with more than one reference to the career of Bruce Forsyth. A glitterball provides a most unsubtle tribute to BBC Television’s Strictly Come Dancing. And make what you will of Trevor Dion Nicholas as Genie almost barking ‘Nice to see you, to see you…’ in his American accent. Later, Tommy Cooper is name-dropped (this show is set in the (fictional) Middle Eastern city of Agrabah, and there’s more than one fez in sight). Audiences should not, therefore, expect a simple replication of the film: the services of Abu the Monkey, a key character in the motion picture, have been, fortunately, or unfortunately, altogether dispensed with. I personally enjoyed the allusions to other musicals both in the lyrics and the style of musical numbers. One tune, ‘A Friend Like Me’, had the audience enraptured during a medley of verses from other Disney productions, most notably Beauty and the Beast. Elsewhere, the soaring melodies are very much a part and parcel of the Disney magic, and some songs flow so well into the narrative smoothly and naturally, as though this were a Rodgers and Hammerstein musical. 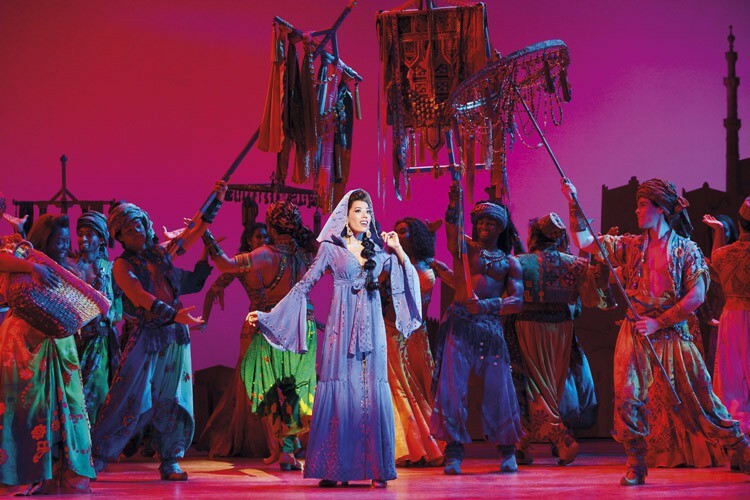 Sometimes the plotline comes to an utter standstill – a six-minute song-and- dance number has the sole purpose of introducing the ‘Prince Ali’ character – but in those six minutes are some dazzling choreography and an almost ridiculous number of costume changes. The set is elaborate and glamorous – and why not? There is nothing wrong with a palace that actually looks like a palace. How the genie pops out of the lamp is more evident from my upstairs vantage point than from the stalls (if you’re looking to take children and don’t want that illusion revealed, I suggest sitting downstairs). How the magic carpet works (and it does work!) is something I couldn’t figure out. Anyone involved in the production who does know has apparently signed an NDA (non-disclosure agreement) in perpetuity, so even if I wanted to throw in a stinking spoiler, I can’t. I simply don’t know how they’ve done that. Sorry. Trevor Dion Nicholas almost blows the roof off the Prince Edward Theatre, with a suitably larger-than-life Genie, conspicuous by his absence when off-stage. Dean John-Wilson is perfectly cast as in the title role of Aladdin, while Don Gallagher’s Jafar is more devious than sinister, though the character’s comeuppance is still very much deserved. Jade Ewen as Princess Jasmine makes the best of a fairly one-dimensional character; feminist critiques of Aladdin, will not, I suspect, be wholly positive. Of the supporting roles, Nathan Amzi’s Babkak was, for me, both the most comical and the most engaging. With 18 ensemble members and 7 swings, this production does nothing by halves, and such is the talent on display I wouldn’t have known otherwise that Arran Anzani-Jones, Miles Barrow, Bianca Cordice, Daniel De Bourg, Seng Henk Goh, Antony Hewitt, Michelle Chantelle Hopwell, Thierry Picault, Briony Scarlett, Sadie-Jean Shirley, Katie Singh and Kayleigh Thadani are all making their West End debuts in this glorious musical. The show is even bold enough to address a common complaint against musicals as a form of entertainment: people do not, generally, start singing and dancing just because their emotions become intense or because something significant has happened. There’s more than one self-parody lyric, the most memorable being, “They’re [the orchestra] playing music while we’re fighting.” The choreography, whilst we’re on the subject, is smooth and energetic throughout. There’s something for everyone in this laugh-out-loud and shimmering show, where the cast come across as thoroughly enjoying themselves. Not since Sister Act The Musical played at the London Palladium have I left the theatre feeling so positively upbeat and overjoyed. I wish Aladdin a long and successful run. This is an Arabian night not to be missed – the professionalism and skill in this show is astounding. 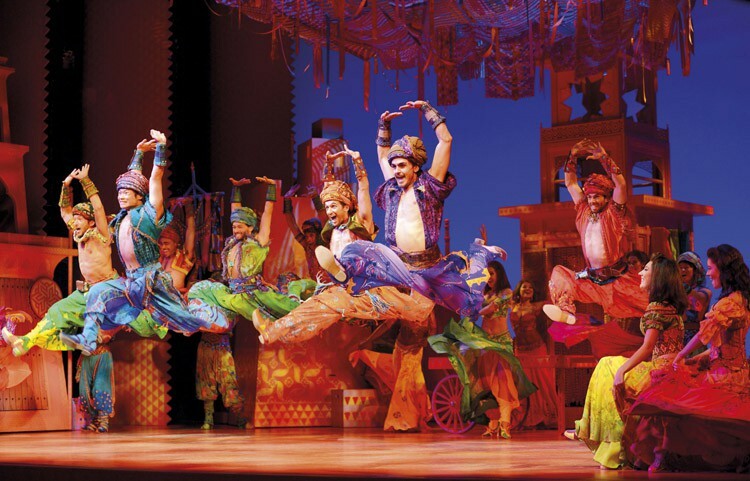 Now in its third record-breaking year on Broadway at the New Amsterdam Theatre, where it has been seen by more than 1.5 million people, Aladdin’s global presence has grown to four productions on three continents. It opened at Tokyo’s Dentsu Shiki Theatre Umi in May 2015 and had its European premiere in December 2015 at the Stage Theatre Neue Flora, Hamburg. 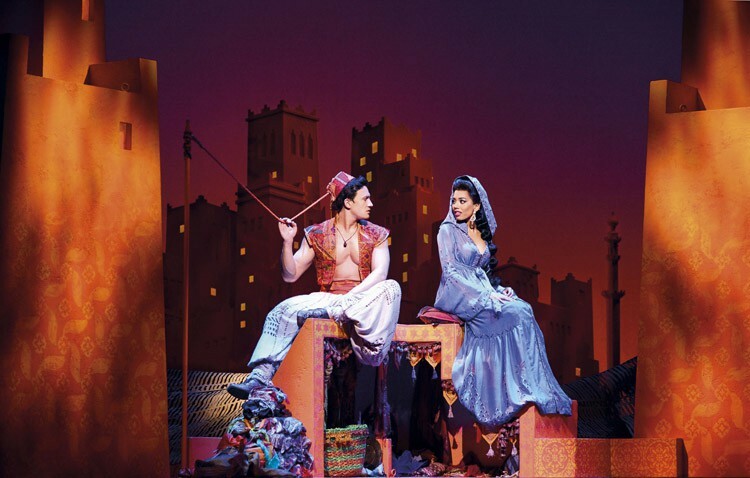 Aladdin will open in Sydney, Australia in August 2016. 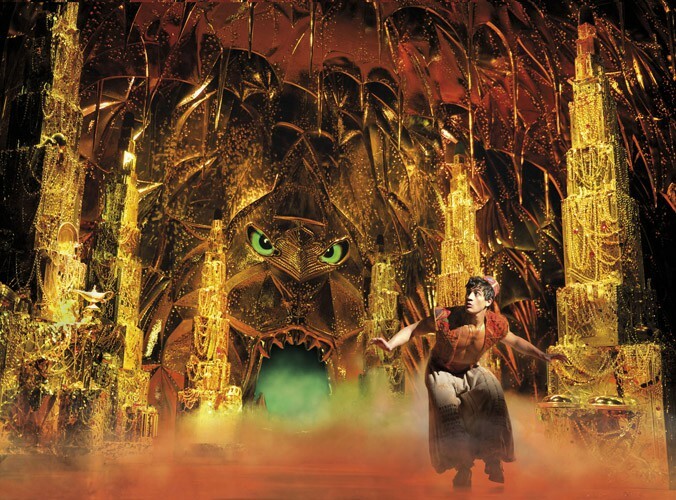 Previous Disney stage productions in London have included Shakespeare in Love and the Olivier-winning productions of Beauty and the Beast, Mary Poppins and The Lion King, which is now playing its 17th year in the West End. 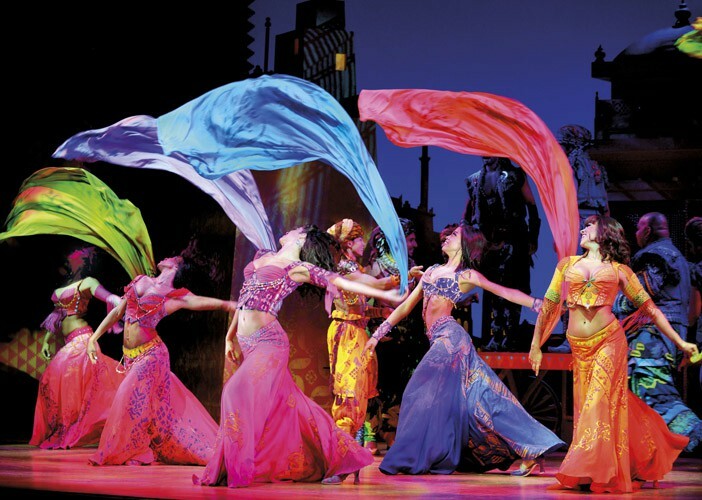 Aladdin is designed by Olivier and seven-time Tony-winning scenic designer Bob Crowley, five-time Tony-winning lighting designer Natasha Katz, Olivier and two-time Tony-winning costume designer Gregg Barnes and sound designer Ken Travis. Casting is by Jill Green CDG.